Cheer up the worn-out-by-work disposition of your endeared one with this present of Fanciful Special Premium Arrangement of Rapturous Flowers and fill the individual's core with floral freshness. 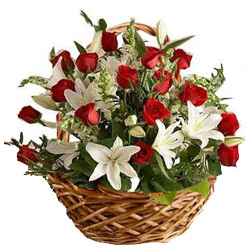 Divine Flowers like Red Roses (10) and White Lilies (3) complete this Special Premium Arrangement. Note: Wooden Basket may vary.